I was recently introduced to cardamom, a spice commonly used in Indian cuisine. Aromatic and intense. These little pods pack a punch of flavor. They come in small pods covered in a thin papery shell. It can be pricey, but one little pod goes a long way. 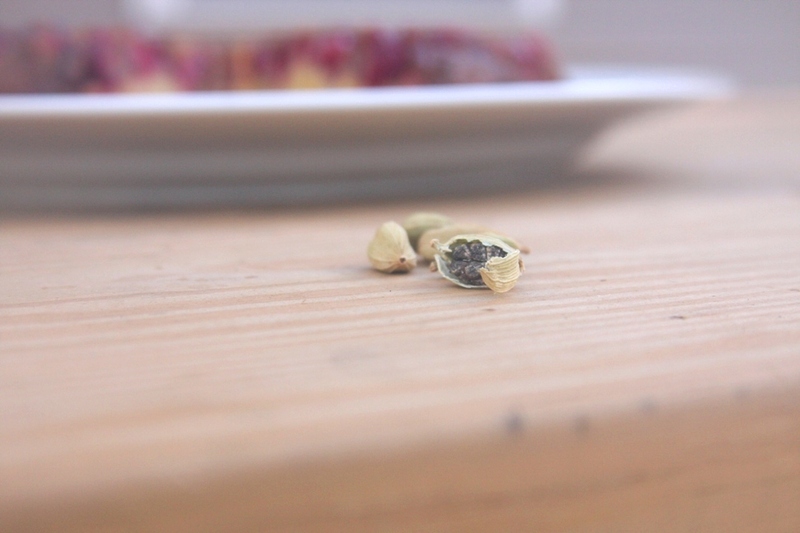 It is best to use fresh cardamom still in it’s shell, as powdered cardamom will have lost most of it’s flavor. Cardamom is commonly used to make tea and coffee, and has some known medicinal properties. My dear friend brought me fresh cardamom pods from Sri Lanka and showed me how to make tea with it. Simply add a whole pod or two to a pot of boiling water with a cinnamon stick, cloves and some star anise (sometimes I add fresh ginger too, depends on my mood that particular day). Let the water simmer for about 15-20 minutes until it is fragrant and darker in color. Strain and serve with a splash of coconut milk and honey. I have been experimenting with this spice, using it in both savory and sweet dishes. Add some into your favorite curry for a pleasant surprise. Just be sure it is finely ground, you don’t want to get an actual “bite” of the cardamom, because it is very strong. Again, like I said before, a little bit goes a long way with this particular spice. I also discovered that this spice merries very well with the other holiday spices, such as cinnamon and ginger. I thought this cake would be the perfect way to bring it into use this season. 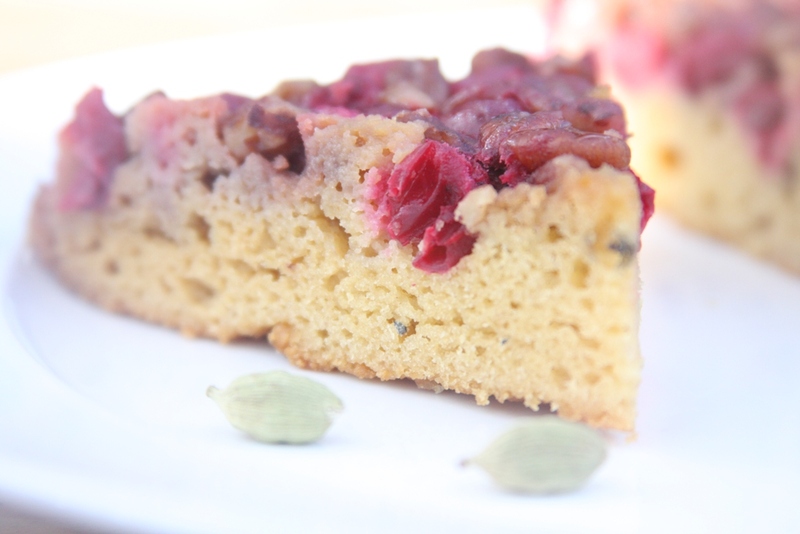 This cake makes a lovely breakfast with tea, or a light dessert treat. Grease a 9 inch pie plate. Melt together the 2 tablespoons butter and 2 tablespoons honey. Pour into pie plate. Sprinkle evenly the cranberries and pecans into the bottom of the dish. Prepare cake batter: Whisk together the melted butter, honey and eggs. Stir in the dry ingredients, until well combined. 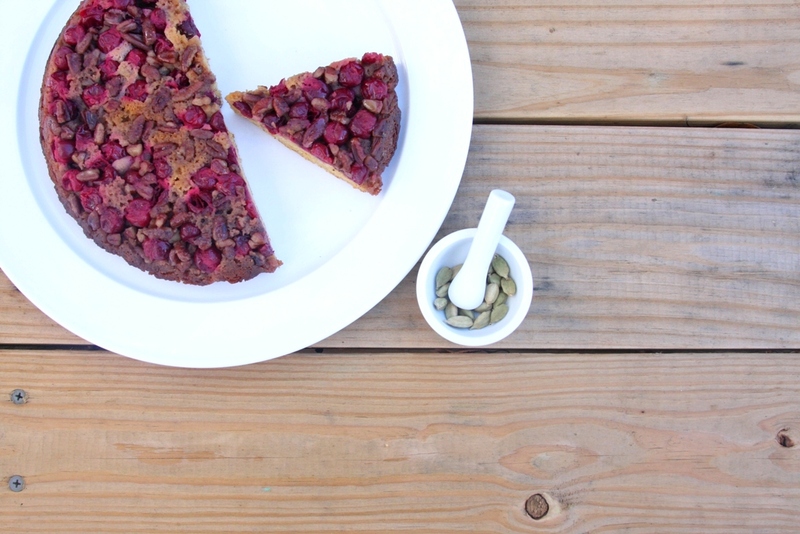 Spread batter evenly over cranberry nut mixture. Remove from oven and invert onto serving plate.